“Although man can forget God or reject him, He never ceases to call every man to seek him, so as to find life and happiness” Catechism of the Catholic Church, 30. Food, water, shelter and clothing are the basics that humans need to survive. Faith though is often overlooked as a need that can give people strength to continue, when their basic needs aren’t being met. In August, the National Shrine of St. Therese in Juneau gave those receiving services at the Glory Hole, Juneau’s homeless shelter and soup kitchen, a chance to explore or reignite their relationship with Christ. Joe Sehnert, the Shrine’s Executive Director, said he received inspiration from Pope Francis to host the retreat at the Shrine. The National Shrine of St. Therese has ministered to the homeless with monthly trips to the Shrine and a haircut ministry, but Sehnert sensed that those who had been coming to the Shrine on a monthly basis were yearning for something more. 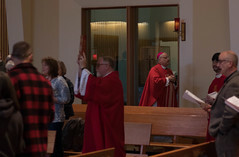 Over the course of three days Sehnert would transport people in the Cathedral bus from downtown Juneau to the National Shrine of St. Therese for a spiritual retreat. The retreat consisted of the daily scripture readings presented to the retreatants by Deacon Steve Olmstead. The retreatants would then reflect on the reading, Lectio Divina style, and discuss questions they had or share the passages that stood out to them. The first day of the retreat only one person from the Glory Hole showed up for the retreat at the Shrine. That didn’t deter Joe or Deacon Steve, they shared and discussed the day’s readings on the feast day of St. Maximillian Kolbe, who died in a concentration camp in Auschwitz during World War II. The second day of the retreat, the Solemnity of the Assumption of the Blessed Virgin Mary, Sehnert had eight people, a full bus, attend the day’s retreat. Before they dove into the day’s readings the group gathered and some shared their personal stories. After they had finished one of the men shared how he had seen and shared the same roof as other people in attendance, but never got to know the people and their stories. Others in the group shared how being able to get away from downtown and not having to worry about finding a place to stay out of the rain, allowed them to open up to share their stories and spiritual journeys. The day’s readings about Mary were impactful on the retreatants, especially one woman who recently found out she was pregnant, after a previous miscarriage. She said she wanted to grow in faith and that she wanted to begin praying the rosary, which she learned during the retreat. 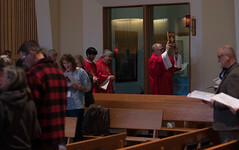 The final day of the retreat, which was attended by eight people, concluded with the stations of the cross. Deacon Steve Olmstead and Joe Sehnert led the participants through Christ’s Passion to share that Jesus was more than a person in a book, but our savior that knows suffering and suffered death on a cross for the sins of everyone. Sehnert said that he already has another retreat planned next year for the homeless and that the other ministries for the homeless will continue every month. The retreat was made possible by donations from Shrine summer parishioners, which covered the cost of transportation and lunch for the three-day retreat. Joe also thanked the Shrine care takers Deacon Jeff and Lisa Volker for volunteering their time to prepare lunch during the retreat.